Welcome to Day 13 of our Divi 100 Marathon. Keep tuning in for 100 days in a row of awesome Divi resources as we count down to the amazing release of Divi 3.0 on the final day of the series! Divi has become one of the most popular premium WordPress themes available. Many in the WordPress community have embraced it and along with this popularity have developed blogs devoted to using Divi and the Divi community itself. In this article, we take a look at the most popular Divi blogs and see what they have to offer. Many of these are blogs of websites that offer services and child themes for Divi and other Elegant Themes products. Many of the sites themselves are made with Divi or Extra. I looked for blogs where the majority of posts were specific to Divi and not their own products for Divi. Those are great too, it’s just not the focus of this article. The blogs should have tutorials, news, code, etc. I also looked for unique content that was well written. I did not include sites that were merely aggregators. Also, I looked for consistent updates. Even an article every now and then is fine, but there needs to be more than just a few articles. If the site hasn’t been updated for a while but still has lots of good info then I included the blog. Here’s the list of 10 Divi blogs you should be reading. The blogs are featured in no particular order. 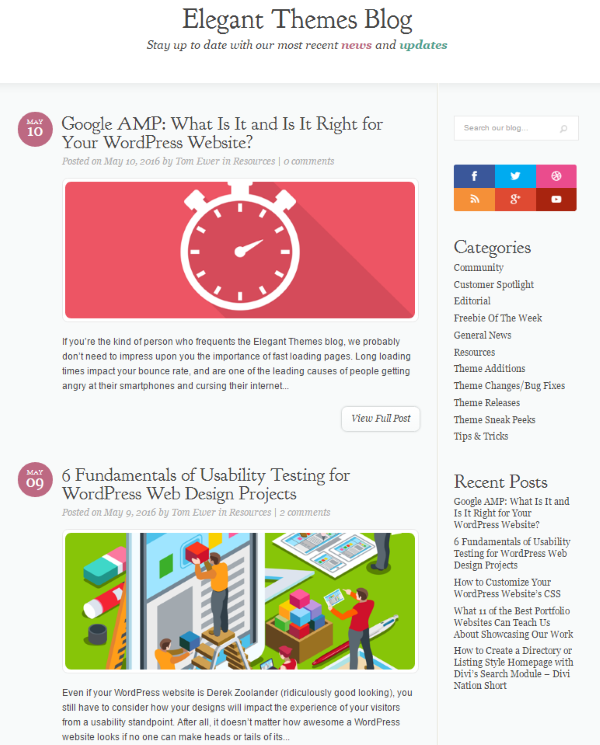 We’ll start this list with one of the largest blogs on the Internet and quite possible the largest blog devoted to WordPress: the Elegant Themes Blog. The blog has a strong Divi focus and includes articles from several writers that have written about WordPress for many years. These are writers that I look up to in the WordPress community. Topics include web design, UI, UX, code, WordPress in general, conversion, moving websites to WordPress, business, and lots more. The blog is updated daily. Articles are detailed and written to the highest standards for audiences of all levels of WordPress experience. ET also has a video/podcast specifically for Divi with interviews and how-to’s and an accompanying blog post with links and code that you can copy and paste. There’s also a newsletter with daily updates from the blog. Divi Soup is from Michelle Nunan and has an interesting design element where the theme of the website and articles is based on making soup. 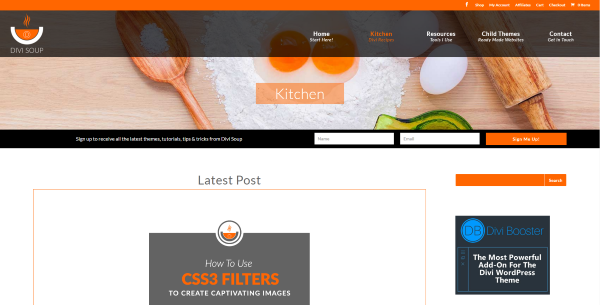 The blog is called “Kitchen” and includes many recipes of creating and cooking up websites with Divi. Most of the content is tutorials. They even include Ingredients (with a link to Divi or other resources), Cooking Time (the time it takes to create the topic of the tutorial), Preparation (where to go in WordPress or Divi), and Method (what to do in code, adjustments, etc.). Quick Snacks are shorter tutorials. Topics includes CSS, menus, sections, sliders, headers, images, and more. I love the style of using the “cooking” theme of writing tutorials. The articles are well written and primarily focus on Divi but also include Elegant Themes plugins and WordPress in general. 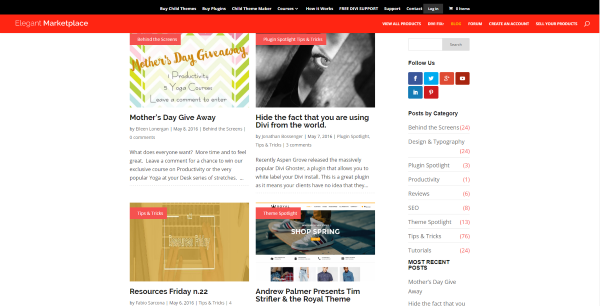 They also have a newsletter that include themes, tutorials, and tricks and tips. Elegant Marketplace Blog is from Eileen Lonergan and Andrew Palmer. It includes lots of tutorials, tips, tricks, reviews, and more. Their design and typography category includes design ideas and strategies to improve UX. Their tips and tricks category includes information to help improve productivity, creating various layouts in Divi, resources, and more. Topics for tutorials include SEO, security, making backups, using child themes, and lots more. The articles are well written and detailed. They have both a strong focus on Divi and on WordPress in general. Geno Quiroz is a famous name in the Divi design community. Geno’ blog includes lots of tutorials, code snippets, resources, and tips. Tutorials cover lots of helpful Divi tips, business tips, and web tips. The Divi tutorials mostly cover Divi settings and CSS. The code snippets add lots of cool features to your Divi website. 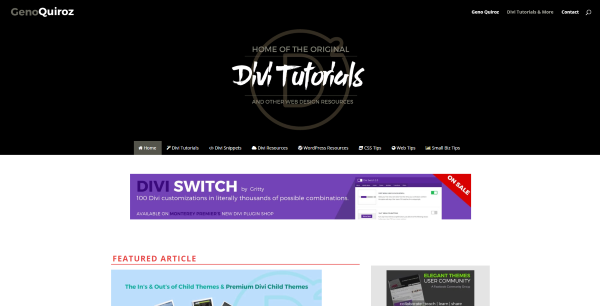 The Divi Resources include links to many tutorials, child themes, plugins, example websites, and more. Geno’s articles are detailed and include code snippets that you can copy and paste and he also has links to live examples. There’s also a newsletter with the latest updates and tutorials. 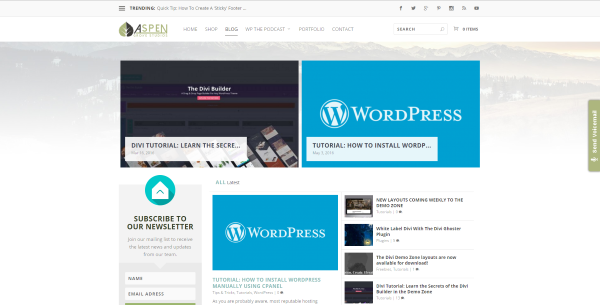 The Aspen Grove Studios Blog, which is built with Extra and is a great example of what can be done with Extra, is a Divi blog from Cory Jenkins and David Blackmon. Topics include tutorials, tips, child themes, plugins, freebies, and more. Tutorials include interesting ways to use the Divi modules. Articles include code that you can copy and paste into Divi modules. Divi is the primary focus. Other topics include WordPress in general and business. The articles are detailed and laid out nicely. Some of the articles include the information as videos. This in an interesting addition that makes it easier to follow. I’d like to see others have video integrated into their posts like this. They are currently working to add a podcast, which I’m looking forward to. The newsletter includes the latest news and updates. 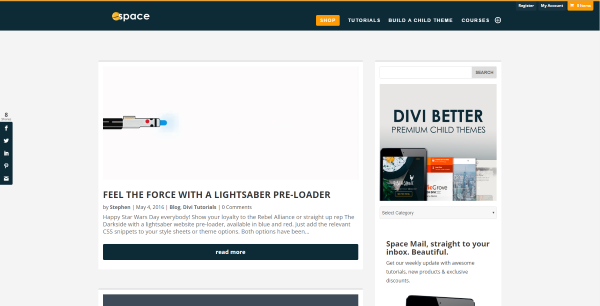 Divi Space is a Divi blog from Stephen J. and includes lots of tutorials about Divi. Topics for tutorials include custom modules, CSS, working with child themes, building custom pages, menus, fonts, plugins, comparisons, links to resources, and WordPress in general. The tutorials include videos to step you through it and code that you can copy and paste into Divi. 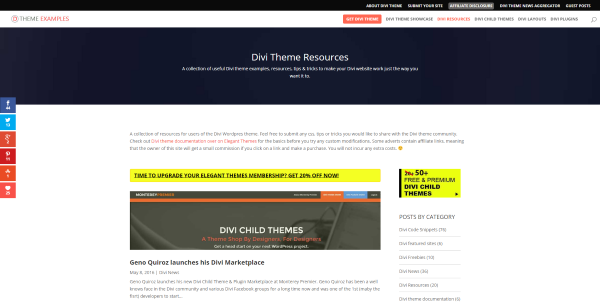 The website includes a Divi child theme builder that lets you create child themes and download them. It includes editors for footer links, login, custom PHP function, child stylesheet, custom screenshot, and you can even include custom CSS. This is one of the most interesting features of any of the websites and it’s free to use. They have a newsletter with weekly offers and updates that include Divi child themes, plugins, courses, and resources. 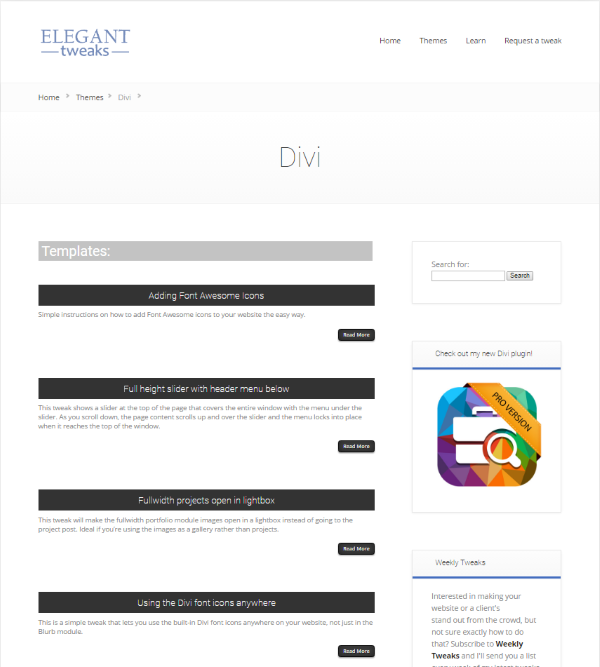 Divi Theme Examples includes a blog with lots of Divi resources. Articles include news, links to various articles around the web, freebies, tutorials, example sites that use Divi, video tutorials, and more. Freebies include lots of Divi layouts. The free Divi layouts are detailed and look like a lot of time was put into them. This is an excellent source of free Divi layouts and you can learn a lot by examining how the layouts were made. In order to get the free layouts all you have to do is tweet about it, Like it on Facebook, or share it on Google+. Most of the articles are resources and news. The video tutorials include a short written introduction. All of the information is found within the video rather than having the info included within the post. Their newsletter includes updates about Divi news and freebies. Elegant Tweaks is a blog that posts tutorials with code to help you tweak your Elegant Themes products. While this includes all ET themes it has a strong focus on Divi. Most of the tweaks include CSS styles to change the appearance. Some of the advanced tutorials include CSS and PHP. Topics include sliders, fonts, icons, CSS animation, modules in general, CTA buttons, menus, 3D navigation, and lots more. The tutorials are comprehensive and primarily written for coders. Even though the tutorials are about coding, they include step-by-step instructions and have extra information just for beginners so anyone can use them. The code is included so you can copy and paste into Divi. The articles also include links to examples so you can see how the code should work. There is a weekly newsletter that includes links to all of the tweaks for that week. The Divi Magazine is from Andras Guseo, a web developer from Switzerland. The magazine focuses on Divi, the Divi Builder, and Extra, and includes lots of how-to’s that include CSS, icons, fonts, module adjustments, and more. 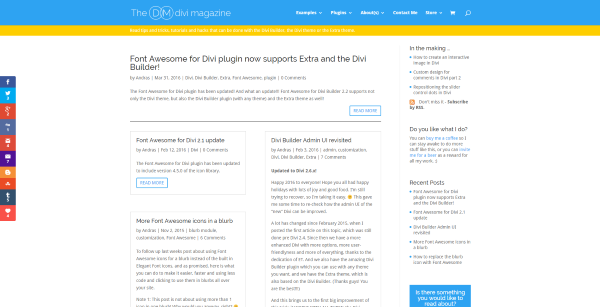 Articles also discuss new releases of Divi and its features as well as UI improvements. The articles are well-written and include the code so you can copy and paste. Even though the focus heavily on code, the articles are explained step-by-step and will appeal to all audiences. The articles even explain how the CSS works. The code explanations are labeled within the article and can be ignored if you don’t want or need the information. Most of the articles are short and include code that you can copy and paste. Dan explains where the code is to be placed within Divi. He also shows how to adjust the code the get the effects you want. All of the code is also available in a plugin that he sells from the website. You can get 20% off the price of the plugin by signing up for the newsletter. Dan also runs a blog just for ET’s Extra called Extra Booster that includes lots of tips and tricks specific to the Extra theme. There are several blogs that are either new, have only a few posts, or haven’t had any updates in a while that are worth watching. Most include tutorials specific to Divi but some include other ET products as well. It’s possible that some of the older posts may not be applicable with the current level of Divi so you’ll want to be careful experimenting. That’s a look at ten Divi blogs you should be reading. Although there is a lot more information on the Internet about Divi, these ten blogs include lots of news and tutorials to help you customize your Divi website and keep you informed about using Divi like a pro. Many of them include both free and premium downloads. These ten Divi blogs are sure to keep you busy with plenty of reading material and can even help you build your network and portfolio. Elegant Marketplace Blog is a must… The recently released plugins they have for sale really open up what can be done with DIVI/Extra. Thank you Michelle for such an amazing blog! Another great article, Randy… thanks for including the Aspen Grove Studios blog! You’re welcome Cory! Thank you for the hard work you put into your blog! Here’s my Divi blog: http://divitheme.net/blog/ – I don’t publish new articles very often though. Thanks for the link Andrej. Your blog looks great! These Divi tutorial blogs have shown new ways a users can use the theme. Very valuable resource to the community. FYI: Divi tutorials directory works as a categorized blog post aggregator for all those Divi blogs mentioned in this article. 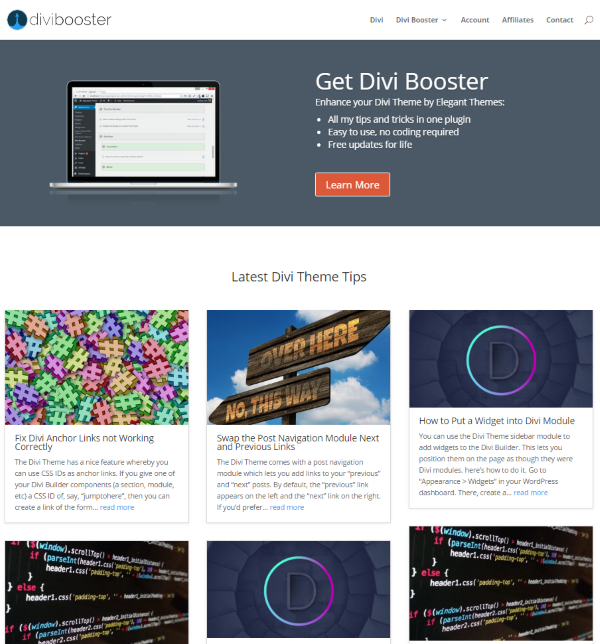 Divi soup and divi booster are my go to ‘finding new tweaks’ blogs. Divi soup has some seriously good tweaks and divi booster is simple plugin that simplifies a lot of small issues. Thank you Geno for the hard work you put into your blog and helping make the Divi nation great! I’m thinking of getting Divi 2.0 now. Will current customers be transitioned over to Divi 3.0 or should I wait till 3.0 comes out? thanks. You can get Divi in it’s current iteration and transition smoothly to version 3.0. I haven’t been able to find a good plugin or program to take website screenshots like this post has. Could anyone out there, or elegant themes blog writers point me in the right direction please? Great posts. Keep them coming! Hi Tyler. I use several tools including the Snipping Tool that comes with Windows 10, a screen capturing extension for Chrome called Full Page Screen Capture, and sometimes I just do a print screen and paste it into a paint program. I agree with Randy, the “Full Page Screen Capture” extension is great for that! Hi Tyler. If you are using Google Chrome, I would recommend the “Full Page Screen Capture” extension. As a web developer, it does what I want it to do. Just quickly scrolling through this post (I always scroll first before going back up and read everything from the top) – and halfway down I find the solution to something I’ve been wanting to try for a while, but haven’t found the how-to until now. That’s another home-run for Divi 100! Divi Space is the only place where I was able to find out how to make the portfolio grid (both regular and full-width) featured images perfectly square. I asked on the support forum on this website multiple times and no one (not even Elegant Themes) could tell me how to do it. After paying for a subscription I find it frustrating that the people who made the Divi theme couldn’t even tell me how to modify it. Doesn’t give me a whole lot of confidence in them. Great article and about 8 of those blogs have helped me in one way or another. Soon I will be contributing to the divi community through my new site. Hi Trent. I can’t wait to see it! Divi Space is the only place where I was able to find out how to make the portfolio grid (both regular and full-width) featured images perfectly square. I asked on the support forum on this website multiple times and no one (not even Elegant Themes) could tell me how to do it. After paying for a subscription I find it frustrating that the people who made the Divi theme couldn’t even tell me how to modify it. Another way to see the power of Divi. People had created individual blogs to showcase the functionality of one of the most elegant and versatile WordPress theme available in the market. I agree Taugir. It’s a great way to see what others have done and a great way for them to share tips. Divi Soup was new to me, really nice one! Thanks. Hi Verdi. I love Divi Soup. It’s a clever way to create tutorials and the CSS code snippets are top-notch. They have a Facebook page too that I recommend everyone follow. Thanks for the great resource list! and the articles recommended 🙂 Great job! Thanks Anette! I’m glad you liked it and found it helpful. Nice inspiration list! It’s good to see what other developers are doing with the Divi theme. Some have great imagination and creative sense!